Rely on Ben Bush Landscapes to get your yard looking great this year! Providing beautiful landscapes for more than a decade. Thank you for taking the time to visit our website. We appreciative the opportunity to work with you on your next project. Throughout the site you can find galleries featuring some of our past and current projects, a list of our services, FAQ's and warranty information using the navigation bar at the top of this page. Your landscaping creates the first impression others have for your home or commercial property. Designing a landscape to fit the unique features of your home or business requires training and skill. Surround yourself with the beautiful seasonal colors installed by Ben Bush Landscapes provided by Nature. Ben Bush Landscapes has been designing and maintaining residential and commercial landscaping throughout Southern Indiana and Western Kentucky, including the cities of Evansville, Newburgh and Princeton, for the past 10 years. Our company was founded on a commitment to excellent customer service and outstanding design with attention to the small details making each landscape truly unique. We strive to do what it takes to make sure our customers are happy. 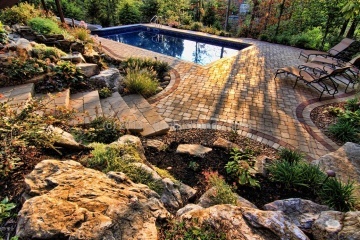 We can create stunning hardscapes including retaining walls, decorative rock paver and flagstone patios as well as elegant waterscapes featuring ponds and waterfalls. We are also skilled with incorporating lighting into our designs to both highlight your landscaping and improve the safety and security of your home. Ben Bush Landscapes provides extensive designs to insure you receive the landscape you desire. We want our customers to understand and enjoy the many components of a professional landscape. When you hire Ben Bush Landscaping to perform your regular maintenance, you can relax knowing that your landscape and all of its fe atures are in the best of hands. 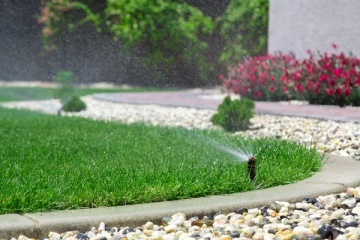 We can install a state-of-the-art Lawn sprinkler system from Rainbird. Irrigation systems are a sure method of keeping your lawn and plants healthy. At Ben Bush Landscaping, we are proud to offer a five-year parts and labor warranty on lawn irrigation systems. 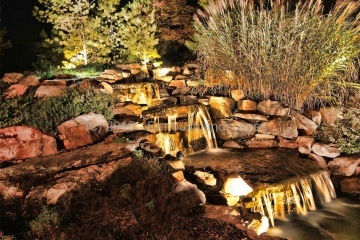 Every landscape we design is unique and customized to your residential or commercial property. We don't believe in "template" landscapes. After all, your home or business is one-of-a-kind; shouldn't your landscape be as well? We honor our commitments and take care of our customers. Our team is made up of skilled landscaping professionals with extensive knowledge and experience in landscaping design, installation and maintenance. Call us or email us today to get started. We can't wait to talk to you about your design and how we can help you have the landscape of your dreams. Ben Bush Landscapes has been our go-to landscaper for several years. He's reliable, honest and has great eye for detail. Our yard is both the talk and the envy of our neighborhood since we first hired Ben! We use Ben Bush Landscapes for our commercial yard maintenance needs every year. He's always punctual, articulate and priced more than fairly for the quality of service he and his team provide. Looking forward to another great looking lot this coming year. Ben Bush Landscapes is proud to be a member of Southwestern Indiana Builders Association and a continual winner every year with our designs.